But what if it's not to mislead an employer, only to elicit a marriage proposal? 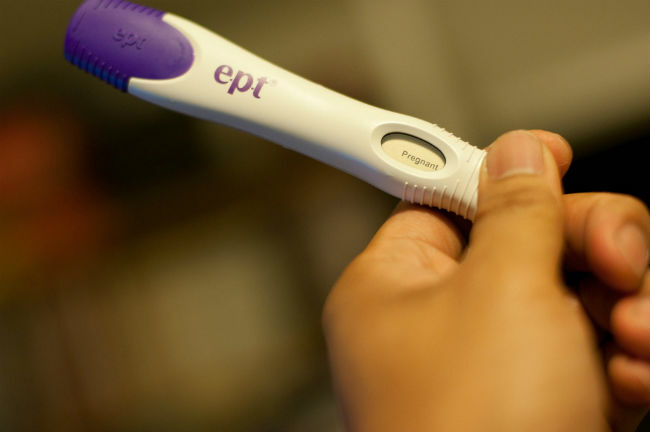 According to multiple reports, positive pregnancy tests are available for purchase on Craigslist. Why would someone sell such a thing, and why would anyone purchase it? The answer to both questions, according to legal experts, may not only be immoral and unethical, but criminal. Outside the world of soap operas, faking pregnancy can be a crime. Just before Labor Day, Courtney and Irvin Murrell were sentenced to jail time for pretending that Courtney miscarried twins. The Murrells bilked various friends, acquaintances and employers out of money for funeral expenses and other miscellaneous costs associated with the fabricated pregnancy and miscarriage. One of the victims was the mother of one of Courtney’s former boyfriends, whom she named as the father of the nonexistent children. Former prosecutor-turned-criminal defense attorney Seema Iyer explained that in New York, where one of the Craigslist ads for positive pregnancy tests appeared, “acting in a fraudulent manner to gain property” is a violation of fraud statutes and a criminal offense. So, if a woman tells a current or former partner she is pregnant when she isn't and requests financial assistance to deal with said pregnancy in any way, shape or form, she is breaking the law. In addition to being in violation of this “scheme to defraud” statute, she could also be accused of violating New York’s criminal impersonation statute. Iyer read the statute as follows: “A person is guilty of criminal impersonation when they impersonate another and [acts] in such assumed character with intent to obtain a benefit or to injure or defraud another.” But realistically, though a prosecutor could go after someone for either fraud or criminal impersonation, Iyer said a woman in this situation would most likely be prosecuted for simple harassment or larceny, which is the legal term for theft. Felder explained that corroboration is important, because historically such situations devolved into a “he-said, she-said” dispute when it came time to sort out the facts. But ordering a test on Craigslist would likely create a paper trail, making it easier to establish fraud, and premeditation. Echoing Iyer’s interpretation of the law, Felder explained that someone using a fake pregnancy to obtain financial benefits from someone she is not married to would be committing “larceny by trick or device. They tricked someone out of money. That’s a criminal offense.” But if a couple marries, and the marriage was based on a lie regarding pregnancy, “That’s what they call fraud in the inception or fraud in the inducement if you get married.” Such a case is comparable to couples that divorce or seek annulment on the grounds that one spouse lied to the other about wanting to have children in order to enter the marriage. But Felder believes that purchasing a fraudulent pregnancy test constitutes “an overt act—and potential conspiracy too.” He is not the only one. “A conspiracy is basically an organization whose purpose is to commit some sort of unlawful activity,” Iyer explained. “You can conspire to sell drugs. You could conspire to sell false pregnancy tests.” An example would be if a woman agreed to sell her positive pregnancy test to another woman who explicitly said she would use it to target various men for money and would split the subsequent proceeds with the woman who sold her the test. Iyer compared faking pregnancy to prostitution, in that both the buyer and seller can potentially be open to prosecution. Keli Goff is a special correspondent for The Root and the author of The GQ Candidate. She has also written for Time and Cosmopolitan.